Quartz, the business news outlet launched by The Atlantic back in 2012, announced today that it has been acquired by Japanese Company Uzabase, owner of the business news platform NewsPicks. The sale is expected to close within the next 30 days. This year, Quartz is expected to increase revenue by 25% to 35% over last year. 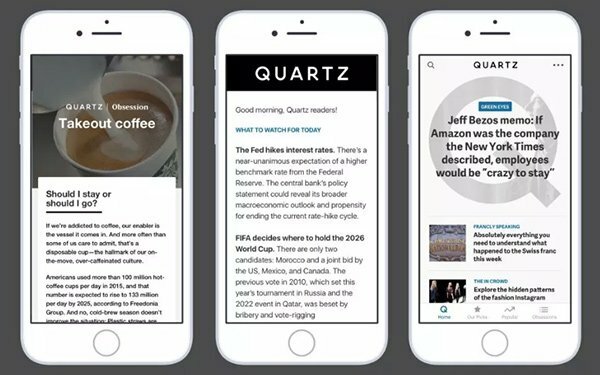 Since launching over half a decade ago, Quartz has quickly gained a wide and responsive audience with more than 20 million people on average accessing the outlet each month across its website, app, email newsletters and video. Quartz is also home to a bot studio and Quartz Creative, a content division that produces commercial work for brands and offers insight, strategy and other business solutions. In all, Quartz has launched more than 600 content campaigns with 350 blue-chip brands. Uzabase, under the terms of the deal, will continue to operate Quartz and its many arms without interruption. No layoffs are expected as part of the deal. Quartz has a staff of 215, including 100 journalists. Atlantic Media will continue to offer corporate support to Quartz for at least the next 12 months, including finance, HR, IT and legal. During that period, Quartz will begin to build its own departments and systems. The outlet will also remain in its New York City offices and maintain its international presence, including London, Hong Kong, San Francisco, Washington, D.C., and Chicago. Uzabase saw a distinct opportunity in the acquisition that will allow it to expand in a much more robust manner globally with the addition of Quartz. It will leverage Quartz’s editorial and advertising prowess with its own expertise in data and niche paid content. The deal also allows Uzabase to expand NewsPicks more rapidly across English-language markets in the U.S. and Europe. As part of the deal, Quartz will manage NewsPicks’ English language editions. NewsPicks launched in Japan in 2013 and was one of the country’s first outlets optimized for mobile. The service, which has a subscription fee of $15 per month, has 3.3 million registered users and 64,000 paying subscribers. According to Uzabase, nearly half of NewsPicks revenue comes from its subscription service, which has grown by more than 80% year to year. NewsPick first entered the U.S. market in mid-2017 under a deal with Dow Jones. In the time since its launch, NewsPicks’ growth is nearly two times higher than its Japanese record. Quartz copresident-EIC Kevin J. Delaney and copresident-publisher Jay Lauf will become co-CEOs of Quartz and will report to Uzabase and NewsPicks founder-CEO Yusuke Umeda. Joy Robins, Quartz CRO, and Zach Seward, CPO and executive editor will also maintain their leadership roles. Atlantic Media Chairman and Owner David Bradley, who will remain with Quartz as a senior advisor and shareholder, shared the news with staff in a memo sent out this morning.